Adapting techniques from the gaming world led to increased interest in professional development activities among Wayne State graduate students. In 2016, the Graduate School launched the Graduate and Postdoctoral Professional Development (GPPD) career development series and an innovative digital badging system to help students demonstrate key job skills to potential employers on social media such as LinkedIn and Facebook. The Graduate School digital badging system was featured in a recent article in Change: The Magazine of Higher Learning. 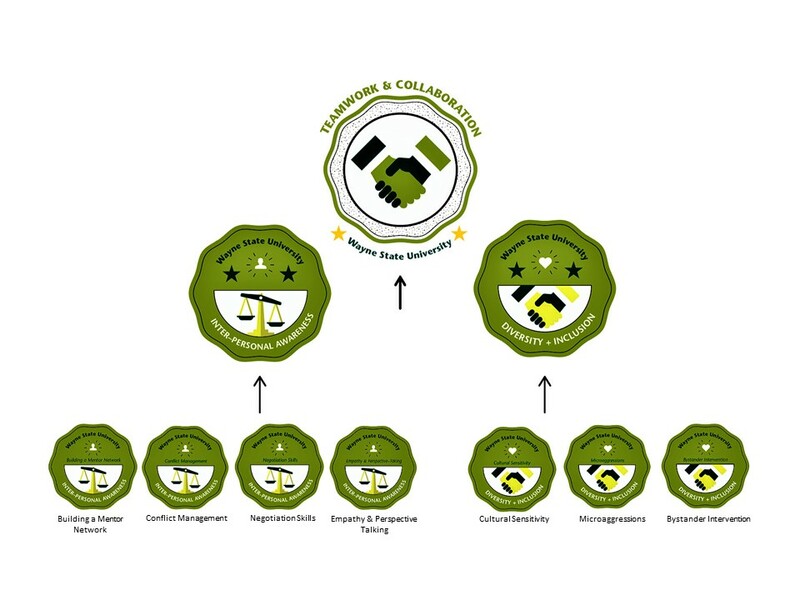 Several universities around the country have contacted the Graduate School asking for guidance in developing a digital badging system for their graduate students, or have asked to partner with Wayne State to create a system on their campus. To enhance professional development, Wayne State graduate students have the opportunity to earn microcredentials or digital badges in five core competencies valued by employers. Earners must complete one level before badges are unlocked from the next level. For example, students must first complete a series of competencies at the first level (i.e. negotiation skills, conflict management and micro-agressions) before advancing to the second level of interpersonal awareness and diversity and inclusion, before moving to the third and final level to earn the overall badge for teamwork and collaboration, one of the five core competencies. The four other core competencies are communication; leadership and professionalism; research and professional ethics; and career development. Students earn badges after attending a series of interactive seminars taught by faculty experts and completing an exercise to demonstrate mastery. Once a microcredential is earned, the badge in graphical form can easily be shared on LinkedIn, or on personal and professional websites for employers to view. Wayne State is the official issuer of the badge, adding credibility and validity to the microcredential. Other team members who contributed to the article include Annmarie Cano, associate provost for faculty development and success, and Mary E. Wood, program director, Office of Scientific Training, Workforce Development and Diversity.